Growing up, my Grandma Norma cooked the dinner (as in lunch) meal for my dad and the hired men on our farm every day they worked, whether they were in the field harvesting or around the farm working. Every day, she had a hot meal waiting for them, plus a delicious dessert. I loved those lunches whenever I went with my dad to the farm. To be honest, lunch was my favorite part of the day. Then eventually, Grandma Norma reached the age where she thought it was time to retire from the every-day cooking. She was 80 years old (or maybe 81 or 82 - I had already moved to Oklahoma when this happened so my memory fails me). Either way, she had definitely earned retirement. Of course, she still occasionally cooks a meal for the men when they are in the field, but mostly, she does as she likes. When I moved to Texas in March, I got the privilege to eat at Royce's Granny's house for the noon meal. It was like reliving my childhood! Except maybe with a few more peppers than Grandma Norma used in her South Dakota cooking. For the last 8 and a half months, I've been driving the two miles to Granny's house for lunch Monday through Saturday. Let me tell you, it has been wonderful! A hot, home-cooked meal followed by mouth-watering, home-made desserts. It just doesn't get much better than that! Well, it was a good thing I cherished those meals. 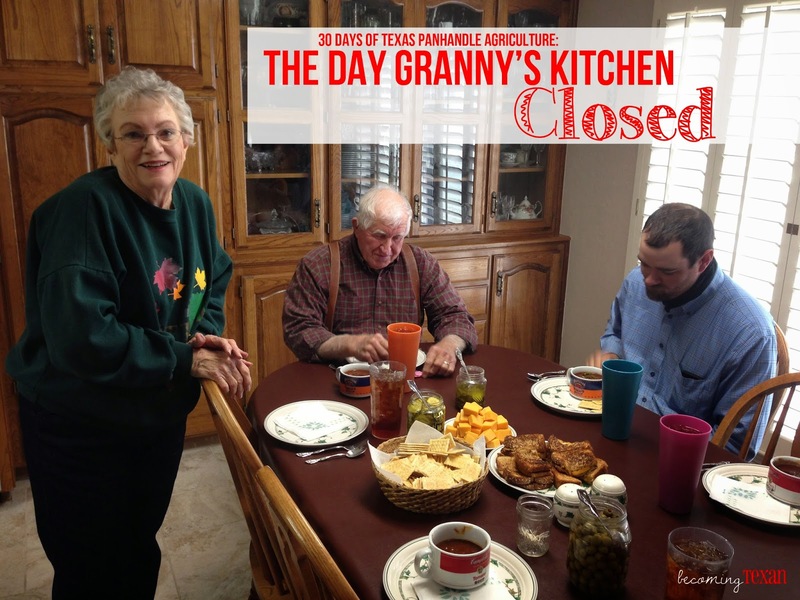 Back in July, Granny announced she would retire from cooking on her 80th birthday, which happened to be Monday, Nov. 10 of this year. A little piece of me died, knowing I'd be on my own to fend for my own lunch after that date. On Monday, I ate a microwavable pizza. On Tuesday, Royce cooked Hamburger Helper. Wednesday, we were in Oklahoma City for lunch so we had Applebee's. Then today, Granddad asked Granny to make chili for us since it was so cold outside. Because she's a wonderful woman, she obliged him, but I'm certain we won't get too many exceptions to her retirement. However, the chili was delicious, and I am sure glad I didn't miss it. Granny's retirement got me thinking though. The farm wife/cook has been such a longstanding tradition on the family farm, but now as Grandma Norma's and Granny's generation reach retirement age (which is much later than the normal retirement age), who is picking up that torch on farms around the country? I know I'm not for now, with a full-time job of my own and, let's just say, "limited skills" in the kitchen. It is ironic to me, that as an agriculturalist, I have little to no interest in cooking, and yet I ask consumers to be more involved with their food. Their involvement is cooking their food. How do I relate to that when I'm pretty sure I keep the microwavable pizza company in business? Until I figure out how to cook, I think I'll heed Granny's advice she gave me when Royce and I started dating: Granny warned me, just as she warned Royce's mother, to not start something unless you wanted to do it every day for the rest of your life (read: or until you're 80 years old). Now that's a commitment! This is the 13th day of my 30 Days of Texas Panhandle Agriculture series. To read more, please visit this introduction post. If you have questions or ideas you'd like me to write about concerning Texas Panhandle agriculture, I'd love to hear from you! Two comments: 1. Happy Belated Birthday to Granny - she shares that birthday with my late dad, who I miss every single day. 2. Do you not remember when I went to the UK and you wanted to cook the suppers for your dad and hired men while I was gone? How we planned out the meals and you even practiced them so you'd know how when the time came? I think you did a fine job because no one went to the hospital, or died, or even quit while I was gone. Just goes to show there is hope for your culinary abilities yet. :-) Luv ya! I have been amazed the past few years how much my dad, (a farmer) now cooks and makes things for himself. My mom always cooked, even with a part time job, but when she went to full time, a lot of the cooking stopped and Dad had to "fend" for himself. Now that I am home and living very close, I try and cook for him and the hired man when I can or when I am not out working with them. But, I don't have his easy chair or his newspaper that he likes after he gets done eating, so most days he prefers to whip something up at home. :) Great post Kaitlyn!